ingrediënten: water (40%), tarwemeel (36%), suiker (10%), garnalen (9%), zout (5%). 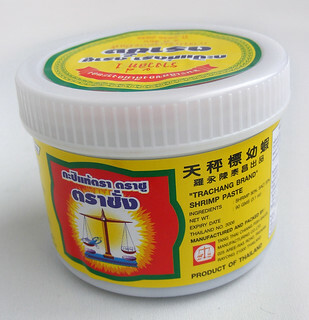 I just bought a small bottle of shrimp paste (imported from Thailand). It is very liquid and looks pinkish-grey, very different from the malaysian /indonesian type of shrimp paste which is brown and hard. I wonder do I have to fry it before using it to make rojak? I searched on the internet and some people say that it cannot be eaten raw? What is your advice on this? I would never use that in a rojak sauce! It tastes horrible even worse than trassi/belachan, while petis udang doesn’t. 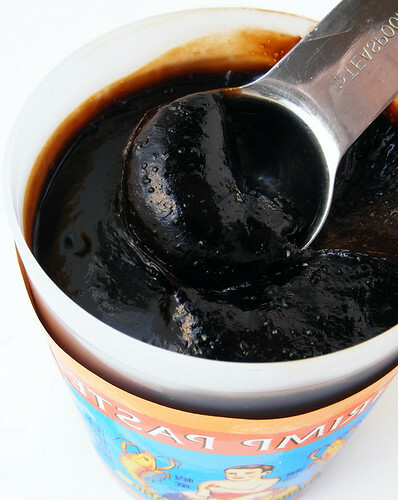 I honestly think it will ruin your rojak. But if you insist, I wouldn’t eat it raw. It is not this brand, but something similar. Oh no, what should i do with this thai shrimp paste? Does it really taste that horrible, can i use it for cooked dishes other than rojak, such as thai shrimp paste fried rice? You can use it in whatever Thai recipe that calls for shrimppaste/garnalenpasta, like in almost all the Thai currypastes. And sure, fried rice too. And besides that I think it should be possible to use it in all Indonesian/Malaysian recipes that call for shrimppaste/trassi/belachan. Hm, Bee, today I saw a recipe that asks for trassi in roedjak manis. 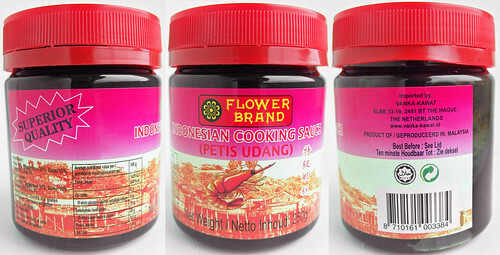 So I checked my Indonesian recipe books and there are a few recipes out there that use trassi, not petis. Thought I should let you know. In those recipes it’s used raw. Although you should always roast trassi in a gas flame before using, so maybe roast it a little longer this time? Cool! Zo te zien zijn die scheermessen een stuk kleiner dan die we hier wel kennen. Leuk filmpje, ik kende het niet, petis madura. Thanks voor de aanvulling.